When I was in New York City a few months ago, my aunt and I asked a gangly, bespectacled older man named Ron for directions. What was expected to be a quick conversation and send-off quickly transitioned into a very detailed and impromptu tour of Greenwich Village, commentated with New York accent-laced reports such as "That bar over there has awful service; my friend went there and they barely talked to him" and "If a person dressed like a monk comes at you on this corner, walk away. It's a scam" and "Don't hold your purse like that! What, are ya carryin' solid gold in it? Just relax!" We were strung along with Ron for about forty-five minutes. Whenever we thought our personal little tour was wrapping up, he'd exclaim, "Okay. TWO THINGS," then proceed onto another indefinite tangent expounding on those two things (for the record, it was never just two things...). He's one of my fondest memories of that trip. Hating how a room looks is a great first step toward progress. It's really important to not hate how a room looks. In my defense, the border along the top of the wall was already there and I had no intention of keeping it in my life (you can see a pathetically half-hearted attempt at peeling it off in the upper right corner). But yeah, it was impossible to get a decent looking before shot of this room because THREE THINGS: dark beige, forest green, and dark wood blinds. I've mentioned before how the bedroom has always been a last-resort for me; I mean, I don't really hang out in it, and it's usually dark anyway when I am in it. Overall feeling? Meh. I pictured Robert DeNiro saying that, if it makes any difference in the connotation. Disclaimer: this is not a how-to. I was thinking of showing my process of scraping that border off, but it's tedious and there were too many pictures of my fingers. This is more of a "Look what paint and a little effort can do!" Since I put this room off for so long, I'd pretty much developed my personal style into its current plateau by the time I went at it. I knew with utmost confidence that I wanted the walls, trim, and ceiling straight-up WHITE. 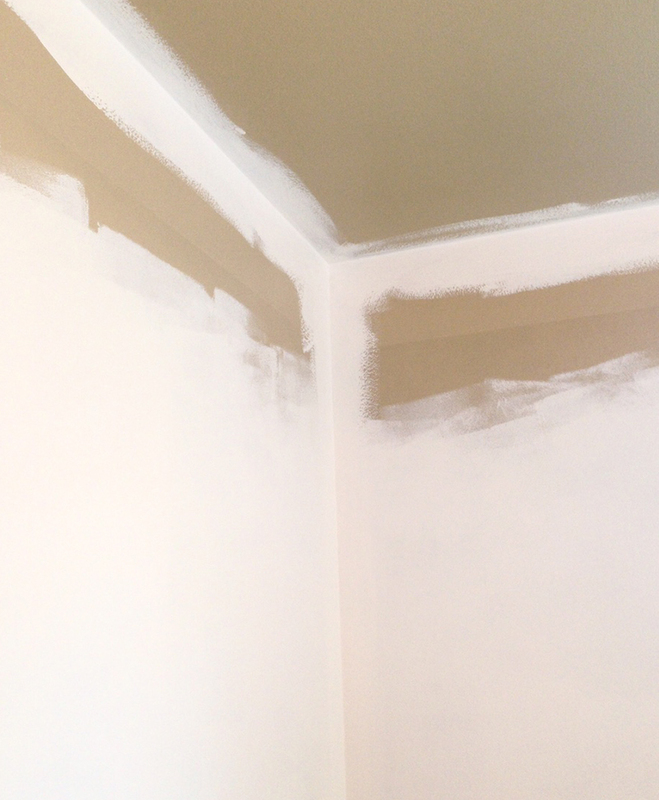 Fun factoid: scraping off the border revealed that the walls and ceiling were all painted with the exact same dark beige shade. It kind of felt like being in an enormous cardboard box. You wanna know what happened when I painted everything white? The room was (significantly) brighter and already a quite a bit happier, so I started updating other details. I actually felt like investing in this room! For example, I'd never noticed that it gets the most sunlight in our house, so I packed it with plants. 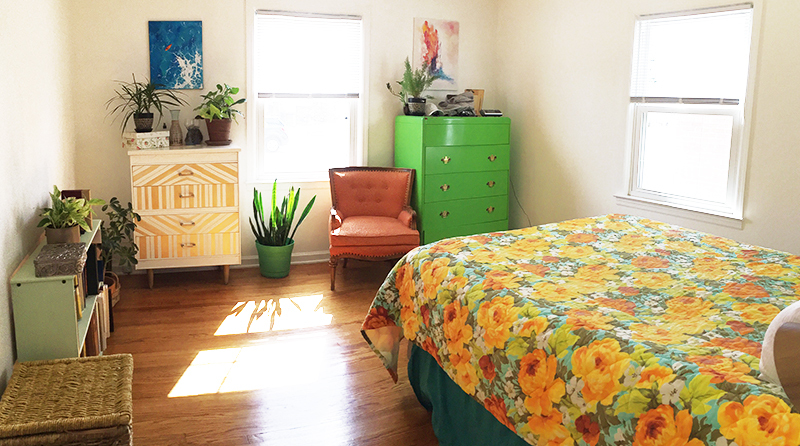 We bought that amazing orange chair at an antique market, I moved that bulky wooden desk into my studio, I replaced the blasé comforter with my grandma's cheerful mid-century quilt, and the piles of junk are much less frequent. As a bonus, that bright green dresser (also my grandma's) is so much more of a statement now that it's not languishing in a murky brown corner. The other day, I went in there just to read and hang out. I have never done that. It's my favorite room now. I legitimately stand in the doorway on sunny days and gaze at it like normal people might look at the Grand Canyon. 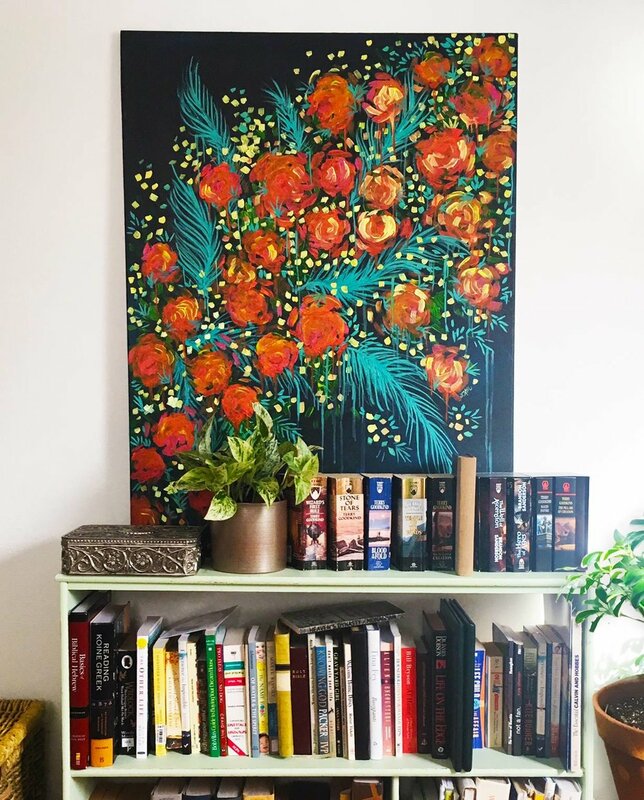 It even encouraged me to paint more so I could fill it with my personality (there's something about brown walls that makes all my colorful paintings look a little washed out). It's a veritable snowball of creativity. Is there a room in your living space that you were totally indifferent to until you read this? 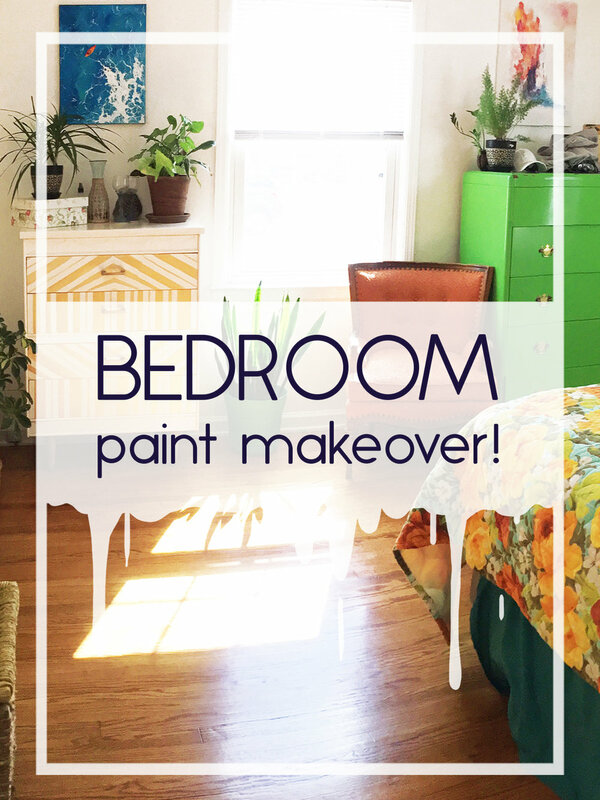 Maybe just a coat of paint is all it needs to start the transformation into your favorite spot! Try it out! I doubt you'll regret it, but if you do, blame Ron. Newer PostWhat is Lynn Even WORKING on?? ?